This famous fudge will make you a star. Don't skip the nuts with their crunchy touch. Recipe includes variations. Milk Chocolate Fudge: Substitute 1 3/4 cups (11.5-ounce package) Milk Chocolate Morsels for Semi-Sweet Chocolate Morsels. Butterscottch Fudge: Substitute 1 2/3 cups (11-ounce package) Butterscotch Flavored Morsels for Semi-Sweet Chocolate Morsels. 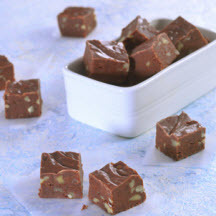 Mint Chocolate Fudge: Substitute 1 1/2 cups (10-ounce package) Mint-Chocolate Morsels for Semi-Sweet Chocolate Morsels.